I’ve said it once and I’ll say it again, I love hiding vegetables in everything! From entrees like cauliflower mac ‘n cheese to desserts like butternut squash bundt cake, there’s nothing better than a delicious food that has a hidden vegetable. You’d never know! 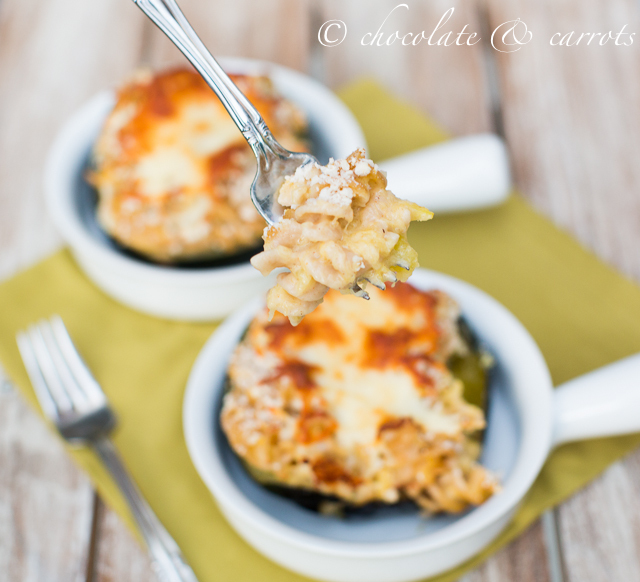 Well, in this acorn squash mac ‘n cheese, it’s kind of hard to hide that the squash is in the mac ‘n cheese because I put it right back into the squash shell. But, I think it’s so fun to have individual servings and using the natural bowl of the acorn squash! Ya know? Have a great weekend! It’s hard to believe that next week is Thanksgiving!!!! Where has the time gone? In an 8″ square dish, lay the squash halves insides-down and pour 1/2″ of water in. Bake for 30-60 minutes until the squash is tender inside. Cook your noodles according to the packaged instructions. In a sauce pan, melt the butter. Once the butter is melted whisk in the flour until combined. Whisk in the milk until completely incorporated and it begins to thicken. Once thickened, remove from the heat and add in the cheddar cheese. Stir until blended. By this time the acorn squash should be done. Scoop out the insides of the squash into the cheese mixture. Whisk to combine. Add in the cooked noodles to the cheese sauce. 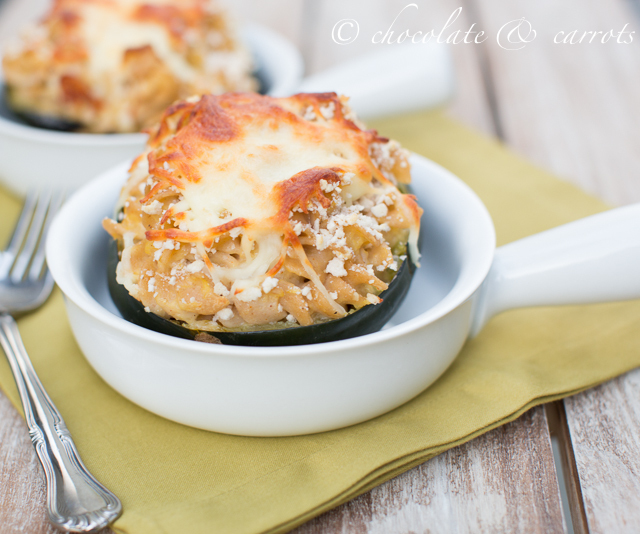 Scoop the cheese covered noodles into the acorn squash shells. Sprinkle the panko and mozzarella on top. Empty the water that is in the 8″ square dish. Place the acorn squash back in the square dish. Bake for another 15-20 minutes until golden brown on the top. 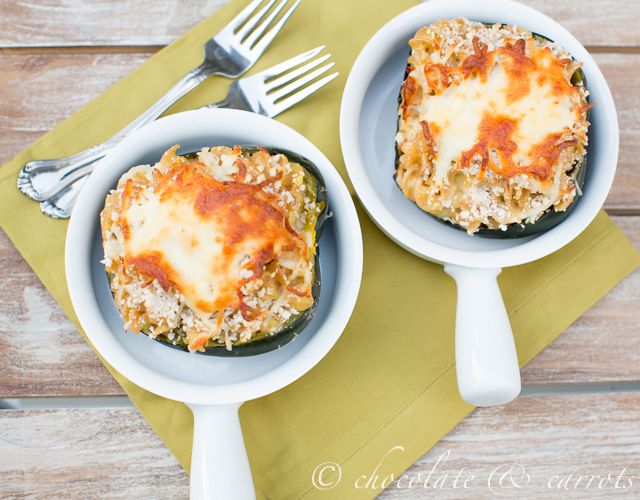 This sounds delicious and I love how cute and extra special it is served in the squash shells! Thank you Lauren! 😀 I just love (almost) edible bowls. Hehe! Thank you Katrina! 😀 Perfect for these fall days! I am a huge mac & cheese fan. I had not thought to add acorn squash in but this seems like a great idea. Thanks for sharing! Me too. Actually, when I was first pregnant with Liam, all I wanted was mac & cheese. So bad, but so good! 😀 Nothing like hiding a veggie in there! I love that these are baked in the squash. This looks so good! Oh good! You’ll have to let me know how it turns out Maura! This is a beautiful recipe with an incredible presentation. Very creative!! Yum! I am seriously head over heels for any squash in mac and cheese right now. I just love how you served yours – very cute!